Securing sensitive data like Personal Health Information (PHI) is top of mind for all healthcare organizations. Pair Key Orchestration with your encryption strategy to meet compliance regulations, decrease losses caused by data breaches, and manage third-party risk. Must meet compliance mandates like HIPAA and HITECH. Protecting PHI during a breach is a top concern. Complex partnerships & business relationships introduce additional security concerns. With Key Orchestration, healthcare organizations and their partners get an encryption key management solution that will protect PHI. Ensuring control of PHI type data and how that data is being protected is what’s a priority when discussing encryption requirements related to healthcare compliance regulations. 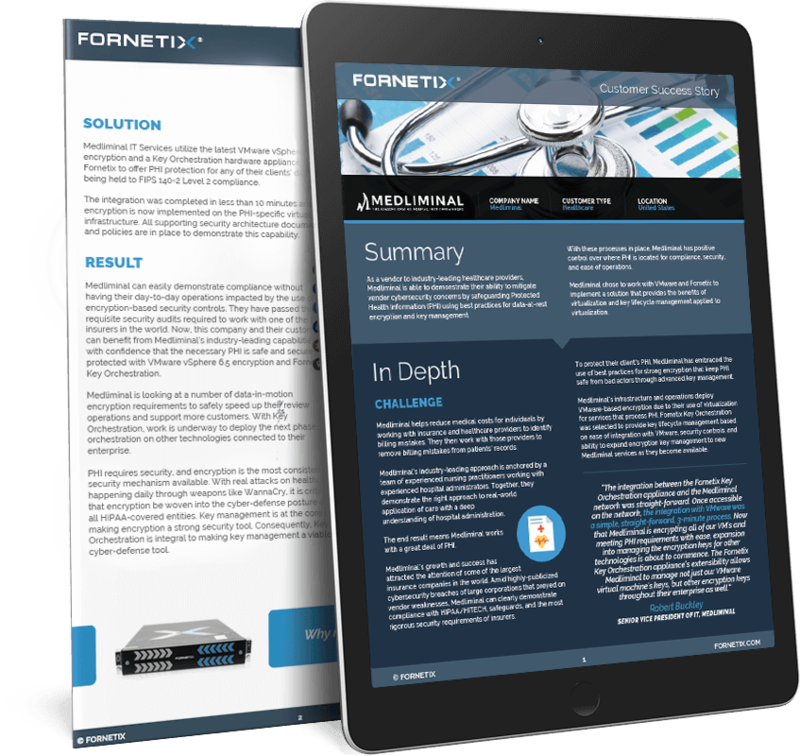 No matter where this PHI is being stored (cloud, on premise, virtualized), Fornetix Key Orchestration integrates with your storage provider to maintain centralized administrative control and governance of encryption keys. Whether the cause is external or internal to an organization, data breaches are happening an alarming rate. Keeping nefarious actors out may seem like an impossible feat, but focusing on protecting the data itself is something that is absolutely within your control. Key Orchestration enforces organizational policy when it comes to encryption algorithms and encryption key rotation; all from one, easy-to-use dashboard. Leverage the benefits of third parties while minimizing risk of compromised data by maintaining control of a secure channel that distributes encryption keys to authorized users no matter their geographic location or type of environment they reside in. Ready to discover how Key Orchestration can simplify key management at your organization? Request a complimentary demo or a custom quote today.